When first signs of life appeared for The Black Glove, it quickly became clear that the former BioShock devs working on the first-person game wanted it to be a bit bizarre. 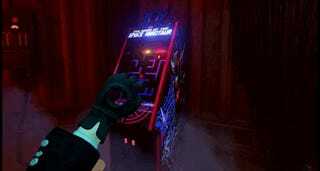 So, their homage to old-school arcade games won't just be a fun, nostalgic mini-game. Those creatures are going to break through into the funky nightclub where the game happens. Things will get even stranger. It turns out that The Maze of the Space Minotaur isn't going to be just some sideline diversion. Like the other actions you can perform in the game, playing the arcade game will affect the stories of the artists who are trying to evolve their creative output inside the Equinox. You can see the neon-colored extratrerrestrials from Space Minotaur showing up in the game's 'real' world in the new trailer below. Joe Fielder, co-founder at Day for Night Studios, told me in an instant-message conversation today that "there is a larger narrative and mythology at work within The Equinox." "It's not all just weird for the sake of surreality," he continued. "Everything is connected." " The Maze of the Space Minotaur won't take much of the player's game time, but we're pushing to make it extremely fun," Fielder said. "It's not a mini-game as much as a full featured game-within-a-game that's easy to pick up, but with a lot of depth and strategy, which we'll teach people through gameplay "feats." "In [the game], you're trapped in a labyrinth full of cosmic creatures and have to collect energy to power your blaster, laser sword, teleport pack, or bomb traps," Fielder explained. "Some creatures hunt by sound, some by sight. Some teleport, some charge. You rarely if ever have enough to power all your weapons and tools, so managing that is a strategic element. You collect energy from fallen foes, so you might need to, say, use a bomb trap to catch one, then kite others into its blast radius to get enough energy for a fight with the Space Minotaur boss. The gameplay 'feats' you need to accomplish are like special achievements that spotlight particularly fun aspects of the game or push you to learn clever strategies you need to pick up. People have described it as "Wizard of Wor-meets-Bomberman," which is a decent Hollywood pitch but misses a lot." "Even though you spend much less time in the arcade game than in the theatre, it's hugely important that we make sure it's not a barrier to the narrative, but that it's a blast to play and that the narrative [effect] is the reward." And when the giant robot monster comes stomping through the early 20th-Century nightclub, I asked Fielder, will be a wholesale disaster? "Oh, I'd say our cast is uniquely capable of dealing with both change and strange things occurring," Fielder says. "They pretty much have to be. They're another element of the game we've barely touched upon. The surreal storyline and unconventional game mechanics have taken center stage. To answer your question though, the maze creatures bleeding over isn't an all at once event. There are smaller incursions at first." The game-within-a-game is part of a larger, more mysterious structure. "We're trying to establish a unique mythology here," Fielder said. "That's something that's really important to me as a writer. A lot of myths that you find in games, film, and television have been overdone. I mean, I never want to see another quote from Revelations or Alice in Wonderland again…" The Black Glove's mythology won't just transpire just one way either. "There will be more than eighty different narrative possibilities for players to explore within The Equinox," Fielder offered. "A standard playthrough will take several hours, but for players who want to see and hear everything, it will take them more than twice that. The game is designed to be fun to replay many times over, with dozens of unique narrative scenes, challenging arcade feats, and surreal scenes within the halls of The Equinox." Fielder says that there are plans to bring The Black Glove to PS4, should the dev team hit their funding goal. If you want to help them do that, you can head to the game's Kickstarter page.